^ Caso, A., Lopez-Gonzalez, C., Payan, E., Eizirik, E., de Oliveira, T., Leite-Pitman, R., Kelly, M. & Valderrama, C. 2008. 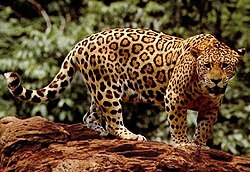 Panthera onca. The IUCN Red List of Threatened Species 2008: e.T15953A5327466. doi:10.2305/IUCN.UK.2008.RLTS.T15953A5327466.en Downloaded on 17 June 2017. ^ a b c d e f g h i Kevin L. Seymour, "Panthera onca," Mammalian Species, No. 340, American Society of Mammalogists, 1989, Pages 1-9. ^ a b W. Christopher Wozencraft, "Panthera onca," Mammal Species of the World, (3rd ed. ), Don E. Wilson & DeeAnn M. Reeder (ed. ), Volume 1, Johns Hopkins University Press, 2005, Pages 546-547.